One of our most commonly requested features – officials management – officially releases today! 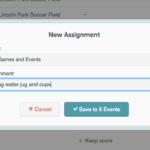 With TeamSnap Officials you can manage referees, umpires and game officials with one easy-to-use tool for assignments, scheduling and communication. Plus, it’s integrated with both TeamSnap for Clubs & Leagues and TeamSnap Tournaments – everything your sports org needs to operate efficiently in one place. Import or enter your officials. Using your TeamSnap for Clubs & Leagues scheduler or TeamSnap Tournaments event schedule, assign officials to games (manually, or save even more time and let officials self-assign). Notify officials about assignments and communicate to individuals, groups or everyone with email or push messages before and during the game. Officials can view their schedules, accept/decline assignments and receive communication from your organization directly through their mobile phones. Have a game change? No problem! Officials are notified of game changes and required to confirm the new game time. Take look at this short video to learn more. If you’re already a TeamSnap for Clubs & Leagues or TeamSnap Tournaments customer, reach out to your sales rep or email [email protected] to learn more. Jill Antweiler is the director of product for league scheduling and tournaments. She lives in Jefferson City, MO with her husband, their four amazing kids and their two cats. In her spare time, Jill enjoys exercising, reading, drinking wine, playing games, finding restaurants with good appetizers, hanging with the fam and chauffeuring her kids to their activities.